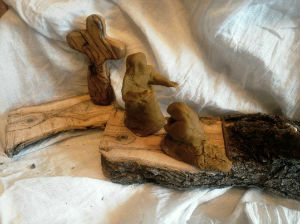 During Lent this year our home groups followed a Bible Study course God, Creation and Us. They looked at issues such as Climate Change, seeing what the Bible has to say about how we care for God's amazing Creation and seeing what practical things we can do. would like to introduce you to their fellowship groups. Monday afternoons 2.00 pm, fortnightly. Our group meets every two weeks on a Monday at 2.00 pm. When we all come it’s quite a squeeze but Brenda copes very well. We start with a drink and biscuits and then the conversation begins, and usually becomes very lively! Brenda does a very good job bringing us to order and starting the Bible Study. Not a very easy task when we are in full flow but we did actually get through the Paraclesis course. We ploughed through but did learn a lot about coming alongside others and journeying with them. The new course about Natural Evangelism is proving to be very interesting and informative. Our group is not slow to contribute and we can sometimes go on for three hours! We do enjoy our times together and want to thank Brenda profusely for having us at her home. Our home group meets fortnightly on Monday evenings at 7.30 at the home of Angela Bennett. Over the past year we have studied a variety of topics including Prayer and the Letter of James. Numbers have fluctuated during the last year with several people having to step back because of other commitments. Currently we have five members, but we would welcome any newcomers! This group was born several years ago out of the monthly Coffee Mornings meeting on the remaining Tuesday mornings of the month in the West End at St Peter's. There are about 12 of us in the group at the moment. We start at 10 with a welcoming cuppa and aim to be well finished by 11.30. By 10.15 we get down to look at the study for the day, led by one of the group, usually using a booklet published by Scripture Union, which we discuss freely - and laugh often. This year the titles have included 'God's Word - Power to shape our lives', 'Self Esteem - Seeing ourselves as God sees us', and of course, like other groups, we worked through the excellent Lent Course prepared by Tony Ward called 'Give a reason for the hope'. We open and close with prayer and sometimes we sing a hymn - we think we sound quite good, and I think it is true to say we are all learning and growing in our faith through these times. Tuesday evenings 7.30 pm, weekly. Our Home Group which is held on Tuesday evenings, 7.30 pm at Arnold Hartshorn's home. We read various chapters through a six week cycle and discuss them, whilst trying to put ourselves in the shoes of the people of that time and their cultures. On occasion we have changed to a Wednesday evening, e.g. Lent or Paraclesis sessions. These times help us to have an even wider view point and a different way to search our faith. We do not have a break for tea and biscuits. It is a simple straight through hour, allowing us to have other interests in the same evening. We sound very straight laced but in fact we are a jolly bunch and have lots of laughs which helps to draw us even closer together, whilst learning to understand the Bible and listening to what our Lord is saying to us. New members will be made very welcome. What is Creative Bible Study? What do we do? We read one or two linked passages from the Bible, and discuss how the passage can be visualised or imagined through sound, symbol, colour, and interpreted in word, music, picture or sculpture. Before Christmas we held a ‘Creative Christmas’ morning, and there are plans to have a ‘Creative Easter’. Information has been given out to Churches Together in Belper, but at the moment it is attended mainly by our parish people. Examples of what we create are often featured in 'Three In One' magazine. We meet once a month at St Swithun's Church. Fliers are available in all our three churches. I joined this friendly Home Group for Lent 2015 and was made very welcome by all the existing members. I quickly became part of the Fellowship and was able to share ideas and pray together. We have used different materials and followed the Paraclesis course along with the rest of the Parish, to explore our own faith and how we share it with others. We know that we need to come alongside people more in our everyday situations and we have tried to put this into practice more. 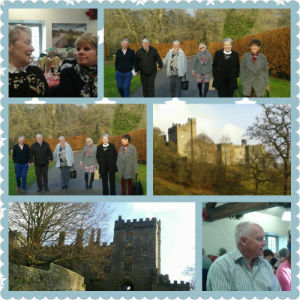 At Christmas we shared a meal at Haddon Hall which was excellent. The group is very ably led by Lynda Dickens and hosted by Janet McGinty. I would like to thank them both for their gentle, warm and loving approach to their faith. I look forward to sharing more during 2017 and growing in our faith and fellowship together. Older Young People’s Home Group... Meet & Eat! We do exactly what it says on the tin. Wednesday evenings 7.00 pm, fortnightly. After being challenged at Lee Abbey in the summer of 2015 to 'create community' we decided to change the way we ran the home group for the older members (and ex-members) of YPF (Young People's Fellowship). Since that time we have been hosting a fortnightly 'meet and eat' group which does exactly what it says on the tin ... we meet, catch up, share stories, eat food, and have fun. These times are based on the simple principle that sharing food and offering hospitality is the best way of creating community. There are numerous examples in the Gospels of Jesus himself taking the time to eat with others ... from disciples to tax collectors and we are trying in some small way to reflect His practice and learn from His example. "I shall do my very best to strengthen my community through kindness and love, welcome visitors and strangers as I would welcome Jesus, give and receive lots of treats - and laugh often". We pray that with God's help this group will continue to share, eat and laugh together. Wednesday evenings 7.30 pm, weekly. A typical meeting of this group includes Bible study, worship and prayer. The Bible study uses material from a wide range of sources and is designed to be suitable for both new and mature Christians. Our current study is based on the theme of the previous Sunday as we follow the Creed. The group has about 9 members, of mixed ages but more are welcome. · a closeness of fellowship that could never occur in the wider circle. · a place where things can be shared, help offered and relationships developed. · considering concerns and current issues in a Christian context. · learning what the Bible has to teach us. We meet at our home every Wednesday except for weeks that include a Bank Holiday and the whole group would be delighted to welcome new members. If you would like to know more, please do not hesitate to ask. Our house group meets every Wednesday evening, except when holidays intervene, from 7.30 to 9.30 pm. Once or twice a year we have a "Bring and Share" Social Evening, instead of a Bible study, when we enjoy one another's company and an enjoyable meal. We are welcomed with coffee and biscuits or cake at our normal meetings, where we spend about thirty minutes chatting and relating to the events of the day. Then we open our Bibles and one of the group will say a short prayer before we get down to serious study, which sometimes leads to a little fun and frivolity, but mostly is a time of serious discussion on the subject of the previous Sunday's Bible readings and sermon. Occasionally we find our questions too difficult for a conclusive answer so we turn to a number of Bible commentaries. Wednesday evenings 7.30 pm, fortnightly. The Evening Home Group meets on Wednesdays fortnightly at 7.30 pm (to about 9 pm). It’s a lovely group of people who study, discuss and socialize together with a smile! We always have an eye on what we need to learn and rejoice in as we seek to help God’s Church to grow in Openwoodgate and the wider St Peter’s Parish. 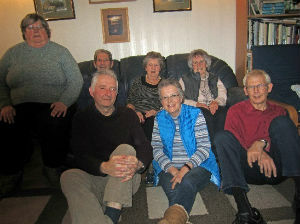 The Group normally meets at Geoff and Kay’s home where we enjoy great hospitality and encourage one another. We can always squeeze in new members – please ask and join us! 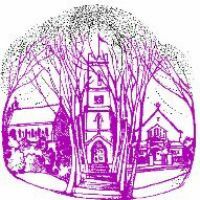 We are a Group of ten who usually meet fortnightly at 7.30 pm on Thursday evening at 48 Dovedale Crescent, except during Lent and when we took part in the Parish course – ‘Come and See’, when we met weekly. We have a varied programme which we plan at informal meetings at the beginning of January and July. We have drinks and eats, whilst we plan a programme for the next six months. Bible Study or listening to and discussing the topic on the CD UCB Word for Today are mixed with evenings of poetry, a quiz, visiting speaker, a visit to another church, games evening, talks and film shows on a holiday to Iona and one to Greenbelt. We weren’t able to fit in a craft evening last year. We have been rounding off the year by attending the Carol Service held at St Swithun's on a Thursday evening in December. Drinks and biscuits after the meeting accompanied by lots of talk putting the world to rights. We then quieten down to finish the evening with Compline. Thursday evenings 8.00 pm, weekly. Our Home Group was established in 2015. We are a diverse group of people of varying interests and ages. Our get-togethers cover a range of subjects and books found in the Bible. For instance, we endeavoured to understand Genesis from the perspective of the people living at that time, assisted by a book written by Prof John H Walton. More recently we have started an in depth look at the book of Revelation, and tried to gain some insight from John's point of view, when he received the 'Revelation' whilst up a mountain on the Island of Patmos. We have also watched a DVD called 'Life on the Frontline' and considered what our personal front lines may be, which differs from one person to another. We are not a stuffy group and therefore feel free to enjoy sharing our thoughts and opinions, and also having a laugh. Our weekly meeting usually concludes with a time of open prayer, where we can pray for each other when requested to do so. At the appropriate times of year we try to fit in a BBQ, Christmas snacks etc. Home groups are often places where faith is deepened and where real issues can be discussed in a safe and accepting way.